This year I challenged myself to read 80 books and I won! In the end I managed to read 82 books; that's 10 books more than last year! I hope you had wonderful holidays! I can't believe 2012 is almost over, but I'm very excited about 2013! But that's not the reason for this post! You want to know who won the very first IMPOSTOR ARC that I'm giving away, right? Could you please email me (books@susannewinnacker.com)? To all those who didn't win: don't worry, you'll get another chance in the new year! 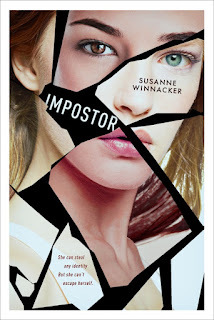 IMPOSTOR ARC giveaway + news! Impostor has a new - an earlier pub date! Razorbill will publish it on May 23, 2013! Less than 6 months to go! To celebrate my new pub date, I'm having a Christmas giveaway and you can win a signed ARC of IMPOSTOR (and some swag like stickers and postcards!)! CAN TESSA POSE AS MADISON . . . AND STOP A KILLER BEFORE IT’S TOO LATE? Tessa is a Variant, able to absorb the DNA of anyone she touches and mimic their appearance. Shunned by her family, she’s spent the last two years training with the Forces with Extraordinary Abilities, a secret branch of the FBI. When a serial killer rocks a small town in Oregon, Tessa is given a mission: she must impersonate Madison, a local teen, to find the killer before he strikes again. Tessa hates everything about being an impostor—the stress, the danger, the deceit—but loves playing the role of a normal girl. As Madison, she finds friends, romance, and the kind of loving family she’d do anything to keep. Amid action, suspense, and a ticking clock, this super-human comes to a very human conclusion: even a girl who can look like anyone struggles the most with being herself. - May 23, 2013 from Razorbill/Penguin! This is the very first ARC I'm giving away on my blog! The giveaway is international and ends on December 27th. I'll announce the winner on the 28th. All you have to do to win is post a comment! Fellow Apocalypsie Hilary Weisman Graham, author of REUNITED, tagged me to be part of The Next Big Thing bloghop! Here's her post about her current WIP! And now I'll be talking about my own work-in-progress! What is your working title of your book? Well, the idea for this book came to me after I was done with Impostor. I had other plans for its sequel but then I had new inspiration and decided to take Impostor 2 in a slightly different direction. It's a thriller with supernatural elements. It'll be represented by my agent Jill Grinberg! It took me about 8 weeks to write the first draft. A bit longer than it took me to write Impostor (6 weeks). I'm a fast drafter! That's tough. Maybe Mind Games from Kiersten White or Starters from Lissa Price? Optioned for TV by Warner Brothers! The Life Beyond (sequel to The Other Life) is available in e-book form!